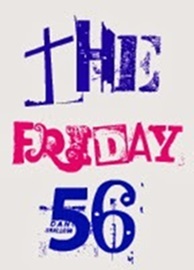 The Friday 56 is a weekly blog meme hosted by Freda’s Voice. Join us every Friday and share an excerpt from a book you’ve been reading. *Find any sentence (or a few, just don’t spoil it) that grab you. *Add your (url) post here in Linky. Add the post url, not your blog url. It’s that simple. Tasha Suri’s Empire of Sand was my final five-star read of 2018 and it was a good one. I loved the world-building and characters equally and can’t wait for more from this writer. You can check out my snapshot review of this one here. Cover is linked to Goodreads. I gave it five stars, sorry for the confusion. Love that excerpt! Seems like a powerful thing to say. I love how it really captures the essence of the novel. I came across this recently and it sounds thrilling. Great choice for your excerpt. I loved it so much. Thanks! This does sound like a wonderful fantasy. I’m glad you enjoyed it. This week I am spotlighting Say You’re Sorry by Karen Rose – a thriller from my review stack. Happy reading! I really did, thank you so much! I hope you end up enjoying it if you do. Yes, there is supposed to be an adaption and I’m so stoked. It’s beautiful inside and out. This one is new to me, but it must be good if you gave it five stars. It certainly sounds good. I will have to give it a try. Thank you for the recommendation! Have a great weekend! I’m glad I could introduce you. It was brilliant. Have a lovely weekend too! Sounds like my kind of book, and I love that cover too!! Happy weekend! It’s so wonderful. I’m sure you’d enjoy it if you gave it a go. Happy weekend! Lauren, it’s fabulous. I hope you enjoy! Sounds like you really loved it. It does look like a fun read. I really did. It was such a great fantasy novel. I loved it so much too! I can’t wait to do a reread of it and I’m so looking forward to the companion novel. Aw yay, I’m so glad you liked Empire of Sand, Alicia! I had my issues with it but it was such a creative, fresh story with a beautiful romance, and I definitely think more people should give it a go! It’s that slow-burn romance that really won me over. I have no defense for it. I also found the magical system to be incredibly beautiful. This sounds so interesting! Excerpt has me intrigued already! It’s an amazing read that I highly recommend.